Two weeks ago I shared a review with you of the ColourPop Yes, Please! Pressed Powder Shadow Palette and today I have their newest 12-pan palette for you. This is the SHE Pressed Powder Shadow Palette from the KARRUECHE Fem Rosa Collection. Just like the first palette, the SHE palette retails for $16, which is incredibly affordable. The 12-pan ColourPop palettes are smaller than an average palette. The size of these palettes is one thing that I am seeing people are most surprised by when they receive their order. The pans in these palettes are smaller than the regular ColourPop pressed shadows, which cost $5 a piece. Getting 12 shadows for $16 is definitely a really good value, even though you're getting smaller pans you're getting a lot of product for your money. The KARRUECHE Collection includes one eyeshadow palette, one face palette, and three lip products. I did purchase the accompanying blush palette but have decided that it's not going to work for my skin tone so I'm not even going to swatch it, and I have one of the lip products which was a freebie with the purchase of at least $20 from this collection. After purchasing the Yes, Please! palette and seeing how good the quality is for the money, I had to try this one as well. I'm not a fan of KARRUECHE, honestly I know nothing about her, but I'm a big fan of makeup and ColourPop and could not skip on this collection because the shades in this palette are right up my alley. 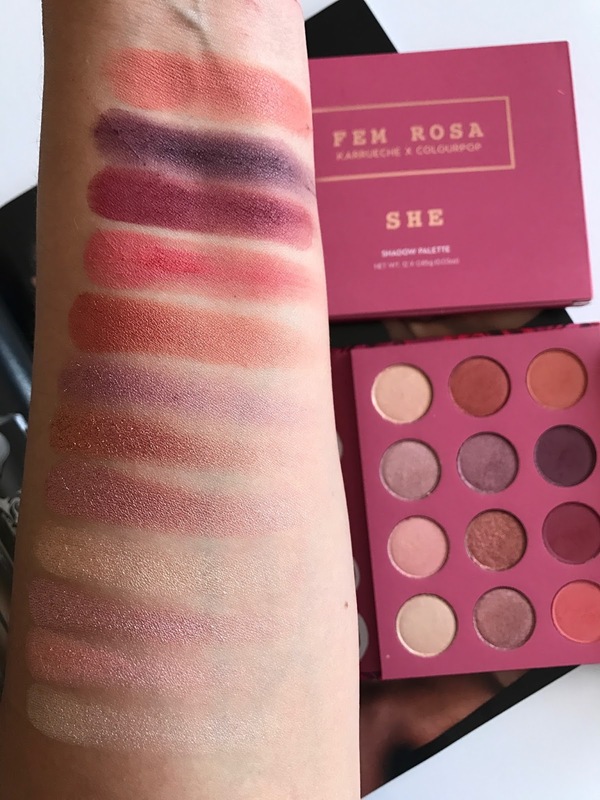 In fact the shades in the SHE palette are so much more my style than the Yes, Please! palette. I also really like the packaging and overall style of this collection a lot more than the first one. The boxes are a beautiful shade of pink with gold lettering that look very feminine and romantic and the actual palette is covered in roses. Quite pretty, yes? These two new palettes are actually my first experiences with ColourPop pressed shadows and I wasn't sure what to expect but so far I have been impressed. As you can see, the color range is absolutely beautiful. The first row is comprised of shimmers that are not as pigmented as the ones in the middle row, but the shades are lighter. I think this entire row is very beautiful, and very soft and in person very pretty. The middle row has deeper shades that are just stunning, I'm super partial to Mademoiselle and Empress, both which are more cool-toned. I've worn this row of shimmers a few times now and find that they do apply perfectly fine with a brush but you have to build them up a little, or you can use your finger for full opacity. The final row are the gorgeous mattes, and they really are quite stunning! Dear and Dutchess are the most original shades in my opinion, those two are the ones that I was truly looking forward to because I don't have many shades in those tones, if any in my entire collection. Of course I also love Missy and Damsel. 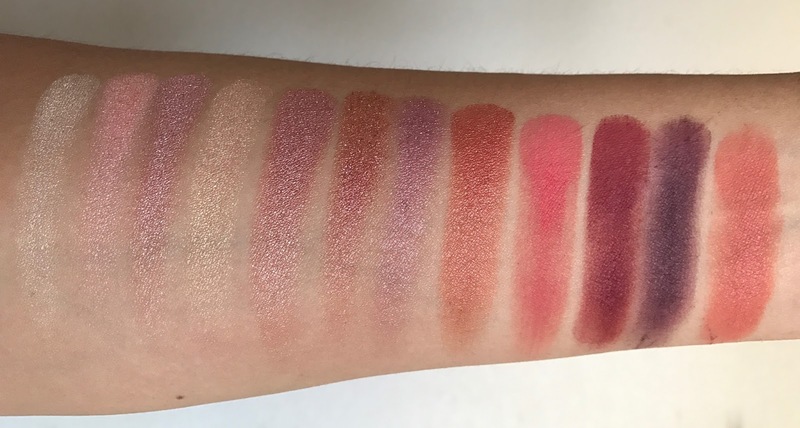 These matte shades are very pigmented, while they swatched just a little bit dusty, they apply on the eye with full opacity and very little fallout. For me one of the most impressive things about the Yes, Please! and SHE palettes has to be how easy they are to work with. Because of the super-low price, one might think that these eyeshadows are going to be harder to work with: need extra blending, dusty and powdery, etc. But I'm finding that is not the case at all. All of these eyeshadows have blended beautifully for me, they also have the smallest amount of fall-out which is pretty incredible considering I am quite a few high-end pallets that have a ton of it. I've only used this palette 2-3 times so I have not even scratched the surface of it fully. But it only took the first try for me to know that they are really, really good eyeshadows. Plus what a value at only $16! I definitely suggest picking up the KARRUECHE X ColourPop SHE Pressed Powder Shadow Palette when it restocks if you enjoy this color range. If you're more of a warm toned lover, then I definitely suggest the Yes, Please! palette. See my review of the ColourPop Yes, Please! Pressed Eyeshadow Palette here. ColourPop set to deliver an affordable, yet high-quality eyeshadow palette option for us and they definitely succeeded.